Wendelin Wiedeking's new venture is set to open its first restaurant next month. Wendelin Wiedeking, whose celebrated 16-year run as Porsche's CEO came to a bad end in 2009, has gone into the pizza and pasta business. Wiedeking, 60, has founded a restaurant chain that will have outlets in Germany, Austria and Switzerland, according to a spokesman. The chain, Vialino, is scheduled to open its first restaurant in December in Ludwigshafen, Germany. 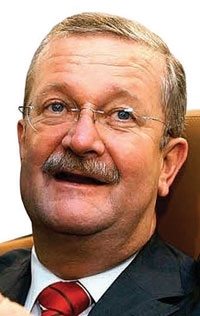 The mustachioed and bespectacled Wiedeking -- the German magazine Der Spiegel once said he looked like "a clerk at a venetian blinds manufacturer" -- has always had an entrepreneurial bent. He made his first million in real estate before turning 30 and since leaving Porsche has invested in various businesses, including shoes and real estate. And he is already in the food business, owning an eatery in his Westphalian hometown of Beckum. But there was one business that didn't turn out so well. While Wiedeking received credit for bringing the Porsche sports car maker back from the brink in the 1990s, Porsche's holding company nearly collapsed in 2009 under the weight of debt amassed during a risky attempt to seize control of the much larger Volkswagen. Wiedeking was fired and the holding company eventually sold its car making business to VW Group.